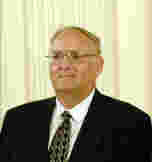 Dr. Ronald J. Eby, Ph.D. 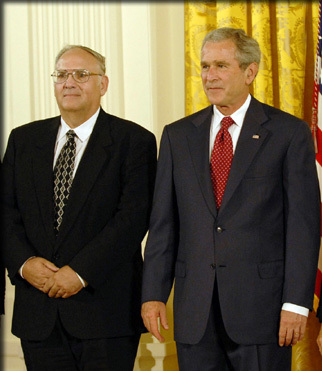 Scientist - Inventor - Developer of the vaccine "Prevnar®"
Dr. Ronald Eby is a renowned researcher who has helped safeguard the health of children worldwide by developing vaccines formulated specifically for children. Eby’s work in the field began in 1965, when he enrolled at State University of New York College of Environmental Science and Forestry [SUNY-ESF]  as a chemistry major. “I was interested in medicine, especially in medical research. I got hooked on carbohydrate chemistry because of the medical possibilities,” Eby said. Upon leaving SUNY-ESF, Eby went to work with Praxis Biologics in Rochester, N.Y., where he and his team, Dr. Dace V. Madore, Ph.D. and Dr. Velupillai Puvanesarajah, Ph.D., went to work developing a vaccine, Prevnar®,  which would become the most efficacious vaccine ever developed. According to the World Health Organization, before the introduction of Prevnar, more than 1 million deaths of children under the age of 5 were blamed on the Streptococcus pneumoniae disease that Prevnar has all but eliminated. Fifteen years in the making, and millions of doses of Prevnar later, the combined efforts of the three scientists and their teams have led to a great advance in child health. Since it became available in 2000, Prevnar® has been called, "one of the most important advances in pediatric medicine," having systematically removed the risk of S. pneumoniae infections in children. In the 1980s and 1990s, thousands of cases of pediatric pneumonia and millions of ear infections worldwide were still being caused by Streptococcus pneumoniae bacteria. The bacteria, which come in seven main forms, are also responsible for other devastating childhood infections, like meningitis (infection of the brain and spinal cord lining) and bacteremia (dangerous blood infection). Left untreated, these infections can lead to permanent organ damage and even death. According to the World Health Organization, one million deaths worldwide in children 5 years and younger were linked to S. pneumoniae infection each year prior to approval of Prevnar in 2000. Since then it has all but wiped out invasive pneumoccal disease in young children, preventing 12,700 cases in the U.S. in 2002 alone. The development of Prevnar® is the culmination of a 15-year effort beginning with Dr. Ronald J. Eby working in his lab at Praxis Biologics (now part of Pfizer Inc.) in Rochester, NY. Dr. Eby knew that he would need to develop new techniques to make a vaccine that would work in the undeveloped immune systems of infants. Available vaccine technology would only allow him to create a vaccine that would work in adults for this condition. The key was to change the vaccine in some way to be effective in children. Most vaccines work by tricking the immune system into thinking that a real infection is taking place, even though it is not. Then when the person is exposed to that illness again, the immune system is already activated and ready to fend it off. Dr. Eby had to find a substance that would stimulate a strong enough immune response in the immature system of an infant to safeguard from future infection. Existing vaccine technologies used the outer coat of bacteria to trigger an immune response from the body. Dr. Eby used this approach but linked a protein to the bacteria's outer coat that could be recognized by an infant's immune system. The catch was that S. pneumoniae comes in seven main forms, so Dr. Eby had to create a separate compound for each of these and roll all of them into one seven-part vaccine. The impact of the vaccine on child health has been dramatic. The development of this type of vaccine has "represented the greatest vaccine breakthrough of the late 20th century," according to Jeffrey Baker and Samuel Katz of Duke University Medical Center. Streptococcus pneumoniae bacteria naturally exist in the nasopharynx, located in the back of the nose. According to the Centers for Disease Control and Prevention (CDC), it causes infection when it escapes from the nasopharynx to other parts of the body, including the ears, lungs and bloodstream. Although it does not cause any diseases where it naturally exists, it can cause ear infections, sinus infections, pneumonia or meningitis if it spreads to other parts of the body. Collectively, these types of infections are called invasive pneumoccocal disease. Pneumonia is a serious condition that can occur at any age, but children are likely to get the disease after exposure to impurities and bacteria that can make their way to the lungs. Older infants and toddlers will likely develop a fever as a sign of pediatric pneumonia. This spike in body temperature causes fatigue, and many children don’t feel like eating since it requires energy and can sometimes make chest pain worse. Adolescents and older children who suffer from pediatric pneumonia may have fever as well, which often accompnies a cough and severe dehydration. Using a cold compress can lower body temperature; bathing your child in a cool bath may also relieve fever. Meningitis is an inflammation of the meninges, which are membranes that line the brain and spinal cord. This condition is typically caused by an infection, and is seen mainly in children, teenagers and young adults. Older adults are also at risk for developing meningitis if they've experienced long-term health issues. Meningitis is highly contagious and can be passed on from one person to another through close contact. Meningitis may also be caused by certain medications and other organisms, although this is quite rare. Bacteremia occurs when bacteria enter the bloodstream. This may occur through a wound or infection, or through a surgical procedure or injection. Bacteremia may cause no symptoms and resolve without treatment, or it may produce fever and other symptoms of infection. In some cases, bacteremia leads to septic shock, a potentially life-threatening condition. Innovation.org, discovering new medicines for better lives and a brighter future, The story of Prevnar®, Ronald J Eby, Ph.D.
 State University of New York College of Environmental Science and Forestry [SUNY-ESF], Success Stories, Ronald J Eby, Ph.D.
 Science Blog, August 2003, Wyeth chemists honored for Prevnar® first combined pneumococcal vaccine for infants, Ronald J Eby, Ph.D.